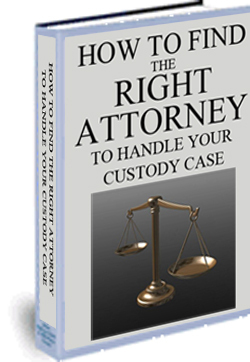 Finding the right divorce attorney can feel like an overwhelming task. And yet it is so very important. Getting a divorce is a huge experience that affects every aspect of your life. It is worth extra time and effort on your part to find a divorce attorney who will represent you exactly the way you want/need to be represented. As you initiate your search, ask for recommendations. Therapists, clergy, physicians and other folks who have gotten a divorce are all good sources of information. How easy was it to contact this person? Was your phone call returned promptly? Generally you are going to want to know about this person's availability and accessibility - two vital components of the attorney/client relationship. Did he/she listen to you and answer your questions? Did he/she seem rushed or impatient? What was the tone? Think twice about hiring someone who is cold, distracted, and/or condescending. Is he/she willing to meet with you for an introductory meeting at a reduced or no fee? Make a list of questions you want answered. This will help you make the most of your time. Never forget that the meter is usually running! A list and some forethought will also help you stay focused and on track. What is your specialty? Are you trained in family law, specifically divorce and child custody? What is your primary caseload focus? What is your fee schedule? Do you offer a payment plan? What retainer do you require? What is your hourly rate? What is your cost estimate for this case? Do you charge for telephone calls and/or e-mail time? If so, how much? How frequently do you return phone calls? How will you keep me informed regarding the progress of my case? Will I primarily be working with you or an associate? Do you have experience handling all types of divorce cases? How do you handle disagreements when you and your client disagree? What are your beliefs about marriage and divorce? Are you a parent? Are you divorced? Are you comfortable settling cases rather than going to court? How do you feel about litigation? Don't be bullied. This person works for you. You are paying him or her to represent you. You must have complete confidence in your divorce attorney. Look for someone who is competent, trustworthy and reliable. As a general rule, stay away from using attorneys who are family friends. This gets sticky really fast. In general, if you feel uneasy,find another attorney. Be completely truthful. Your divorce attorney needs every shred of information to be able to adequately represent you. Be prepared to hear some bad news. You want your attorney to be completely forthcoming with you, even if the news is bad. You aren't hiring your divorce attorney to be your friend. Never use the same attorney as your spouse. If you are not satisfied that your attorney is doing the best at representing you, say so. Ask for what you need. If your attorney's work remains unsatisfactory, find a new attorney.